This second edition post, Wiring Academic Raps II: the Remix, is a more in-depth and updated look at my favorite unit as a teacher: the Crusades Rap Battle! The post is meant to serve as an example and provide resources to teachers who would like to incorporate academic rap writing into their classroom. Feel free to use and remix all of the resources and take advantage of all that I have learned during my 3 years running this unit. Read the original post if you want to see how this unit has evolved over time. Every student should write and perform academic raps. Why? Well I assume if you are here reading this you don’t need any convincing. However, for anyone who isn’t sure, check out these 5 Reasons I’ve laid down in my blog post for Flocabulary*, an educational hip hop site dedicated to improving student learning through rap music. The following is an overview of a Crusades Rap Battle I have done over the last three years with my middle school social studies students. In the post I will try to broaden the scope of the project and share ideas on how it can be adapted to fit any unit or subject. The goal of this unit can be adapted to fit just about any unit or subject, and will fit nicely with both content knowledge and skills. To hook the students I called upon my school’s art department to help me with making a trophy. I then made a mockumentary about it, again relying on a host of staff members to join in. I also asked last year’s winners to challenge this year’s students, as another way to gets the kids fired up. favorite moments would be showing students the love and support they received on social media and seeing how proud they felt from sharing their work with an authentic audience. While it could be said I took the whole thing a little too far, I believe students follow your lead, and will reciprocate effort with effort! Teaching students to write a full-length rap song can seem like an intimidating task, however when it is broken down into steps, like any writing process, it’s no trouble at all. I like to use the I Do – We Do – You Do format. It provides enough support to get students ready before you release them to work. Here is a copy of the presentation I use to teach how to write academic raps. I also believe that having them collaborate in groups of 2-4 works best – it is amazing the writing that come out as they bounce ideas back and forth off of each other. In previous years students had little class time to practice and rehearse. The final year, I decided to dedicate a day for students to practice on stage for just me so they could get feedback and get a chance to work out the kinks. While one group was performing for me, the other groups were spread around the school practicing. This extra day definitely improved the overall quality of the performances and I highly recommend it! 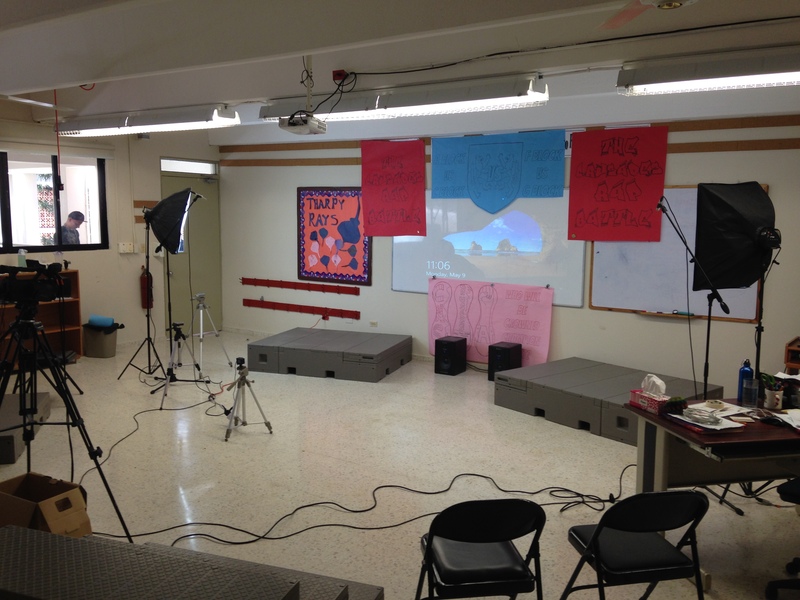 The first year I ran the unit, students performed at the front of the classroom and we taped it on our class iPad. It was fun and the students turned out great performances, however I knew I would have to step up my game. This year, I reserved a common space, set up a stage, had tech support to set up lighting and sound, as well as borrowed the nice school camera with microphones to get a high quality recording. Students came dressed up, many groups with props, and we invited in outside guests to come watch. I also had students write their raps using Google Slides, and we projected the lyrics on the board for the audience to see (we also ran a second projector to the back wall for the performers to read, just in case they got nervous and forgot a lyric or two). To break the ice, and to model a willingness to leave one’s comfort zone, I decided to perform my own Crusades Rap to kick off each class! Watch here for a good laugh! Finally, each class winner was sent to a panel of judges – I sent each judge a link to the winning performances and had them rank them from their favorite to their least favorite. I asked a variety of people to help – teachers from across different school divisions and subject area, admin, and teachers I knew from around the world. I also had the previous year’s winners to add in a student voice to the process! Our school has a school assembly once a cycle, which I knew would serve as a great setting for announcing the winner. With the help of the previous year’s champions, I called each class winner up and got the crowd to give a thunderous applause. This also served as a way to get next year’s students already looking ahead! I then announced the winner, passed on the trophy, and played the winning video for everyone to see. While the students blushed slightly with embarrassment, I knew the recognition was a great way to celebrate their hard work. *Flocabulary, an educational hip hop site, is at the heart of how I incorporate hip hop into my class and is a great tool for this unit. I highly recommend checking out the site and seeing for yourself all that it has to offer; I cannot speak their praises high enough (a full review is long overdue and is coming…one day…I promise!). However, this unit can be done independently of any resource.